Back in February I made up a jar of preserved lemons. The recipe couldn’t be easier – or look more beautiful when complete. Do try to get unwaxed lemons because it can be very difficult to remove the wax otherwise. Cut the lemons lengthwise into six sections, keeping them attached at the stem, so that the lemon will hold together. Pack 1 tablespoon of salt inside of each lemon. Place lemons and black peppercorns into a sterilized jar and completely fill with lemon juice. Seal the jar and leave to mature for 4 weeks in refrigerator. Rinse lemons before using. The jar has been sitting in the dark of a cool cupboard for a number of weeks now and trying to attract my attention. Eventually it succeeded. This recipe is from Claudia Roden’s book Arabesque and is also available on BBC Food. I have always treasured her cookery books and my copy of A Book of Middle Eastern Food is completely dog eared and stained. This was the book from which I learned to make couscous, pitta bread, hummus and baklava, and heard about rosewater and Imam Bayildi for the first time. She included poetry and wisdom from the East and wrote with an exotic passion that struck my youthful heart and made my mouth water. The original recipe for this tagine includes artichokes and I would think that would be terrific, if I had any artichokes! 1. In a wide casserole or heavy-bottomed pan that will fit the chicken pieces in one layer, heat the oil and add the onions. Sauté, stirring over a low heat, until softened, then stir in the garlic, saffron and ginger. 2. Add the chicken pieces, season with freshly ground black pepper, and pour in about 300ml/10fl oz of water. Simmer, covered, turning the pieces over a few times and adding a little more water if it becomes too dry. 3. Lift out the breasts after 20 minutes and set aside. Continue to cook the remaining pieces for another 25 minutes, then return the breasts to the pan. 4. 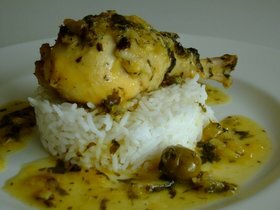 Stir in the lemon juice, coriander, parsley, preserved lemon peel and olives. Cook slowly until the sauce reduces a little. Check for seasoning – the preserved lemons may have given all the saltiness required. Serve with the olives and lemon peel on top of the meat. This is a wonderful dish, fragrant and pungent at the same time, and incredibly easy to make. I served it with plain rice but I considered couscous with apricots. On reflection it really doesn’t need any other distractions; the lemon and coriander and parsley and garlic do a dervish dance in your mouth that is quite delirious enough. 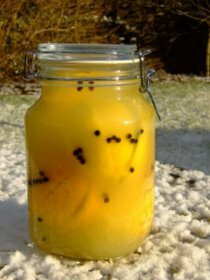 Have wanted to make preserved lemons for a long time now but have never got around to it. One question, once they have matured for 4 weeks and you open the jar to use some, do you know how long you can keep the rest afterward? Very good question. I have stuff to say about this and I will say it tomorrow! Meanwhile, if you can get hold of little tiny sicilian lemons those are the ones to use - I can only get bigger ones. Maybe you could very kindly ship some to us - there's a gap in the market in Somerset. I love, love, love preserved lemons. I have only made them myself once, and had the same experience with the lemon juice shortage and panic. All the running around was well worth it though. Now I am inspired to make some more. Tiny lemons would be wonderful, our supermarket ones are all mammoth and steroidal. I think Meyer lemons make beautious preserved lemons...and I have a baby Meyer lemon tree in my window at work. The still-green lemons on it are properly petite, but alas, there are only 2. Last year there was only 1, so this is an improvement.Maybe by the time I retire, there will be a sufficient crop for a jar. The recipes say Meyer lemons/sicilian lemons and we never see either of them. But in Sainsburys today there was a jar of little tiny preserved lemons from Italy - so minute - and they looked just right. The flavour of this dish is amazing - one of those experiences that makes you want to invite everyone you know over to taste it. That's interesting - I thought you could scrub the wax off but you are right. I always buy unwaxed lemons and often you can pick them up at reduced prices near the end of their sell-by dates - they keep for ages in the fridge. We should look out for Veggiewash - thanks. I've always removed wax from lemons by washing and scrubbing the lemons under hot water to melt the wax. I thought this worked - but maybe not? I thought you could get it off this way too, but Google says no. I wonder what other people think. Hi June, I'll have to look for small Sicilian lemons in the markets and will be happy to send some along if I find them. They usually have 2 kinds of lemons in the markets here: 1. what to me are regular-sized lemons with a regular lemony color and 2. paler, bigger, bumpier-skinned lemons that I thought (could easily be wrong) were the Sicilian ones. I'll ask the next veggie monger I see. Otherwise, sorry, no tips on wax removal. --and to paraphrase Nigel Slater... "When we say bread we mean proper, and when we say water we mean clean, and when we say salt we mean sea, and when we say oil we mean olive"